Port tongs are a unique way to open a wine bottle. Traditionally use in Oporto and England to open very old bottles of port, the use of tongs to open port nowadays is rare but a sight to behold. The use of tongs is for some a romantic and exciting way to serve and highlight a great bottle of ancient port. Even if you don't use them, having a pair of tongs hanging on your wall is a fun decoration and conversation piece. What are Port Tongs and What are They Good For? Tongs are long metal graspers, usually made from cast iron with wooden handles, which have a ring at the end. The ring allows one to grasp the neck of a port bottle. Traditionally, vintage port, a fortified, sweet wine made in Portugal, is meant to be aged a long time before drinking. Good bottles in good storage can last decades or even centuries. 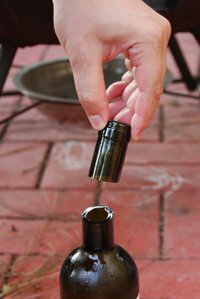 In ancient bottles such as these, removing the cork can be quite difficult without destroying the cork, ending up with bits of cork floating your wine. 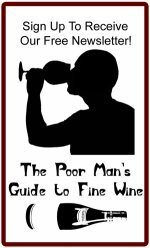 While this doesn't hurt the wine, it is not that attractive to serve and the whole process of removing a cork piecemeal is quite unappealing and unromantic. The purpose of the tongs is to allow you to remove the neck of the old port bottle completely with the cork intact so that service can proceed easily and cleanly. In fact, port tongs can be used to open most any old wine bottles for the same reason. How do they work? Basically, the port tongs are heated in a fire and then clamped around the neck of the port bottle. The then hot bottle neck is chilled quickly. The dramatic change in temperature of the glass causes it to fracture cleanly, leaving you with the upper neck with the cork still intact and the bottle cleanly opened. If done correctly, there are no shards of glass in the break, it comes off cleanly and easily with a clean edge. In reality, most people do not open wine bottles with port tongs. For one thing, most wines, including port, are consumed relatively young these days. Secondly, with careful patience, most corks, even quite old ones, can be removed without too much problem with a waiter's corkscrew or an Ah-so (for details on how to use these see our Wine Opener and How to Open a Wine Bottle page). However, many wine and port lovers like the old fashioned romanticism of port tongs and it is one of the wine accessories which can make a great gift for a wine aficionado, if only for display purposes. How Do You Use Port Tongs? For those of you who are really gung-ho and into port, trying to open your next bottle with tongs may be an exciting proposition. However, it is not always easy and if done poorly can ruin your bottle, make a mess, and more importantly, can be quite dangerous! If you are interested regardless, read on. Disclaimer and Safety Note!!! - We do not recommend you try using port tongs or anything like them to open a bottle of port unless you really know what you are doing. Playing with fire can result in serious injury. 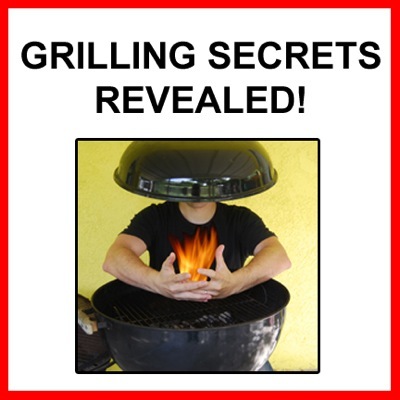 Additionally, the tongs get extremely hot and can cause burns. The bottle can explode, sending shards of hot glass everywhere. We do not recommend you try this at home and will not be held responsible for accidents that result from the use of port tongs. Start a hot fire. When we say hot, we mean hot. Let a bunch of wood burn down for a long time so that you have a deep core of glowing hot embers at the base. You need these hot embers to get the tongs hot enough, just holding them in flames is not hot enough. 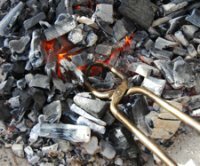 Alternatively, starting a pile of hot charcoal in your barbecue is another good source of heat to heat up your port tongs. 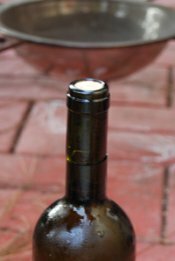 Set up your port bottle, standing, in a safe, sturdy (and non-flammable) space next to the fireplace or grill. If there is a long capsule, remove it so that the glass of the whole neck is exposed. Of note, be sure ahead of time that the end of the tongs fits securely around the neck of the bottle, actually touching the glass for maximum heat transfer. Prepare an ice water bath and submerge a heavy hand towel in it. Keep it nearby. Hold the ring end of the tongs in the base of the fire for several minutes until they are thoroughly heated. Unless they are really hot, this won't work! 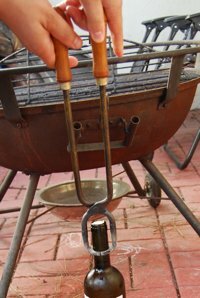 Remove the tongs from the fire and immediately clamp the ring end tightly around the neck of the port bottle. You want the tongs to clamp just a bit below where the bottom of the cork is but still above the shoulder of the bottle and above the level of wine. Hold the port tongs in place 1 to 2 minutes to heat the glass. 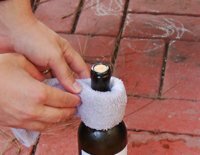 Remove the tongs (and put somewhere safe and non-flammable) and immediately but carefully wrap the neck of the bottle with the cold, wet towel. The sudden temperature change in the glass should make it split suddenly and cleanly. You should hear a clear crack noise as it breaks. You can now practically lift or gently snap off the top of the bottle. Proceed with service of the port as usual, ideally decanting the wine from the bottle into a decanter for service. Most people prefer to use a strainer of some time, such as a cheesecloth-lined funnel, to be sure that no glass shards or wine sediment makes it into the decanter. Done learning about Port Tongs?